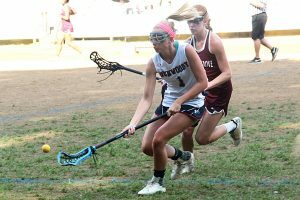 The Dunwoody Lady Wildcat lacrosse squad sent its seniors out in a big way with a 12-7 victory over Union Grove on Senior Night at North DeKalb Stadium on Tuesday. Senior Kyra Perry had a memorable night in her last home game as she scored six goals and had a pair of assists while freshman Phoebe Ringers also tallied five goals. Dunwoody came out on fire scoring the first seven goals of the game to jump out to a 7-0 advantage with 13:50 left in the first half. Ringers opened the game with a goal as she cut to the net and Perry hit her with a nice pass for the score and a 1-0 lead just 1 minute and 26 seconds into the game. Perry would get the first of her five goals just over a minute later as she weaved through the Union Grove defense to make it 2-0. It went to 3-0 with 19:40 left in the first half as junior Jenna Hogan connected with Ringers on a pass out front to make it 3-0. Perry would score the next three goals, two on assists from Hogan (3 on the night) as the Dunwoody lead ballooned to 6-0 with 15:00 left in the half. Junior Kate Snyder set Ringer up with her third goal of the first half with a nice pass to make it 7-0 with 13:50 to play in the opening half. Union Grove got on the scoreboard with 9:00 left on the clock as Demi Williams got inside the Dunwoody defense for the score. Dunwoody answered with Perry’s fifth goal of the half for an 8-1 advantage with 8:13 to play in the half. Caroline Coltharp scored with 1:49 left in the first half and Jill Pickett netted the ball with 56 seconds remaining to cut the Dunwoody lead to 8-3. 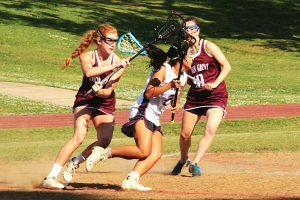 Hogan added a goal to her three assists in the first half scoring with just 11.9 seconds left in the first half to send Dunwoody into the break ahead 9-3. Perry got her sixth goal with 20:36 to play in the game to make it 10-3 in favor of the Wildcats. A goal by Union Grove’s Kaitlin Jones answered Perry’s to cut the lead back to 6 at 10-4 with 18:48 to play. Ringer scored quickly on an assist by Perry to make it 11-4 before Union Grove would score three consecutive by Kaylee Flemming, Coltharp and Michaela Girolami to make it an 11-7 game with 4:15 to play. Neither team could do much over the next several minutes until Ringers closed out the game with a goal with 42 seconds to play to make the final of 12-7.